Having just completed Rapid Software Testing twice in two weeks with James Bach, I’m feeling motivated and inspired to continue learning. Here’s a list of books recommended by James during the course. These will enhance your skills and change the way you look at testing. The first book may be the most important, and the most difficult to read. I’m still getting through my copy. The content is excellent, and there’s a lot to take in. 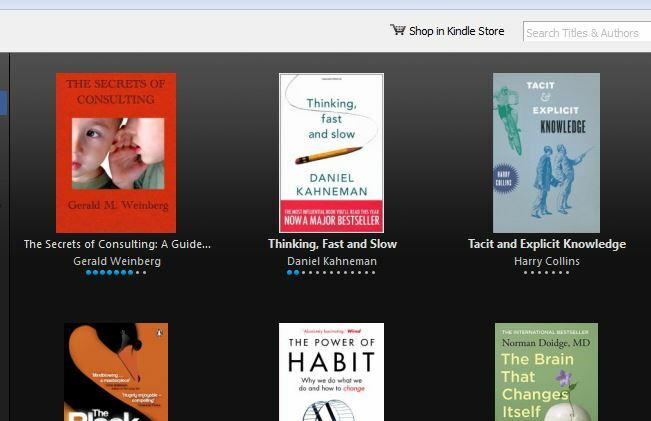 The next 4 books are real page-turners, explaining important and complex information is a way that’s enjoyable to read. I haven’t yet read the last book on this list. If you’ve already read these books, I’m interested to hear your thoughts. For example, what was the biggest takeaway you got from each book, and how has that helped you with software testing? Ask a tester which approach is the best way to test software. The typical response will be “It depends”. But what does it depend on, and why? How will those facors affect testing? Fiona presented her “What’s Your Context?” workshop to the Auckland WeTest meetup group. We split into 6 groups to brainstorm the elements of context that affect our approach to testing. It’s difficult to report on the value gained from attending a workshop, as the learning comes from being involved in the discussion. Here I’ve recorded my brief notes on the “Aha!” moments described by others at the end of the workshop. Me: I’ll be doing this exercise regularly for projects I work on. More aware how much context can change during the course of the project. Natalia: It was very useful to learn about other tester’s contexts. Pete: Two favourite sayings are ‘It depends’ and ‘Why?’. For example, ‘Why are we doing this?’. Morris: We say ‘team’ a lot. Testing is a team sport. Vikas: Highlights the importance of thinking about context deliberately, instead of repeating past processes. Shaheem: Maintain a risk focus, which things can derail or negatively impact the project. Chris: The definition of Minimum Viable Product is heavily context-dependent. Georgia: Focus on the problem being solved. Take history into account. Appreciate the benefit of informal communications (this arose in the context of working with offsite teams). Vincent: Like the experience of working with his team, learning from their experiences, and the way they grouped elements of context together into personal, product, team and development methodology. John: So many sources of information beyond just requirements. Stop and consider context first before you get started. I encourage other testers to take Fiona‘s workshop. Her questions, insights and stories brought the exercise to the next level. At the Let’s Test Oz conference I actually forgot about gender inequality in IT for three days. – Supporting and advocating for my team members who’ve escalated issues of harassment (albeit to no avail). – Working to ensure that team members can return to work part-time after a career break if required. – Championing pay rises for team members who are comparatively underpaid (and usually aren’t aware that they’re underpaid). At most IT events I can’t help but notice that I’m in the minority. At CITCON 2014 approximately 10% of attendees were female. At a recent Splunk seminar in Auckland less than 5% of us were female, and that was confronting. On the other hand I’ve gotten used to management meetings with predominately male co-workers, because that’s the norm today. The Let’s Test Oz 2014 conference was an exception. During the conference wrap-up Anne-Marie Charrett observed an almost equal number of men and women at the conference, both speakers and attendees. I looked around and saw that she was right, and then I allowed this to really sink in… The gender distribution at the conference matched the real world closely enough that I’d gotten through an entire IT conference without noticing the percentage of women attending. That’s progress! While writing this I realised that I’ve never noticed gender at the Auckland Testers Meetups either, again because attendance is representative of the real-world. I think it’s great to notice and celebrate these examples of progress. I’ve written for the Women Testers magazine and attended the Women in Tech meetup to support both initiatives, to further my learning, and to build my professional network and industry profile. I was silently cheering for the few men at the last Women in Tech meetup because they genuinely came to listen and learn about the issues women face. We could do with more of that in tech. On day 3 of LTO I tracked down James and we spent the better part of an hour walking through these principles. Please click on the image below and take a moment to review them in detail. 1. My immediate impression was that the principles are based on a lot of assumed knowledge. I’ve since concluded that these ideas stand alone, and the impression of assumed knowledge was due to the number of unfamiliar terms. In fact the only assumed knowledge is a basic understanding of software testing and an above average English vocabulary. 3. I couldn’t understand the reasons behind the creation of these principles. If James covered this in his talk then I missed it. I was wondering what was wrong with the original list of seven basic principles (shown below). I wanted to understand not just the new principles themselves, but also the need for them, and the thought processes that went into creating them. As an aspiring CDT practitioner, understanding this process of articulating the CDT approach is important to me. While discussing these principles with Anna Royzman over dinner, I mentioned that the new list seemed unapproachable for the masses. Anna agreed with the need for a shorter and more simplistic version, which I’ve called the marketing version. Anyone reading the marketing version and looking for more information could read the full version of these principles to find out more context and detail. I sent this list to James for review, and we started to review point 1 together. Based on James’ questions and comments, I had a basis to further review my own work. These are my brief notes from that review. 2. ‘Facts based on evidence’ doesn’t seem to tie in with heuristics. 6. Sounds like I’m describing Agile testers. “The team” – which team? 7. This point isn’t terrible. 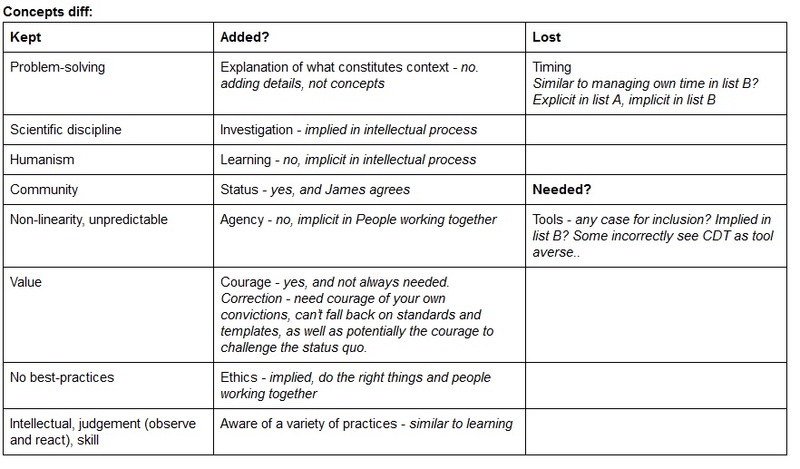 During Skype coaching James posed the question, “If you had to tell someone a few things that would get across to them the *gist* of CDT what would that be?” This expanded the learning exercise for me, as I’d have the freedom to create a whole new list, rather than devising a simplified version of the 10 implicit principles. I decided to first work out which concepts were lacking in the 7 Basic CDT Principles, in order to understand the need for the 10 Implicit CDT Principles. I came up with a working list of the differences (shown in the image below, initially without the information in italics). While reviewing both lists so closely, I gained a greater appreciation for the initial list of principles. I really started to doubt the need for a new short version, and I also doubted whether my creation could come anywhere close to the original. When reviewing some of the differences I’d identified with James, he said something very interesting. His updated list of 10 principles was not intended to replace the original list! Therefore the original list still stands, and my marketing version is redundant. The new list was designed to clarify the implicit concepts which were behind the creation of the original principles. … I wrote the ten by asking myself what did I mean by the seven and what must necessarily be true to achieve them. This was my aha moment. Now I understood that there was no need for a new short list. The original list was not being replaced at all, only expanded upon in more detail. Although I’d started out on a fool’s errand due to a misunderstanding, this turned out to be a productive learning exercise. 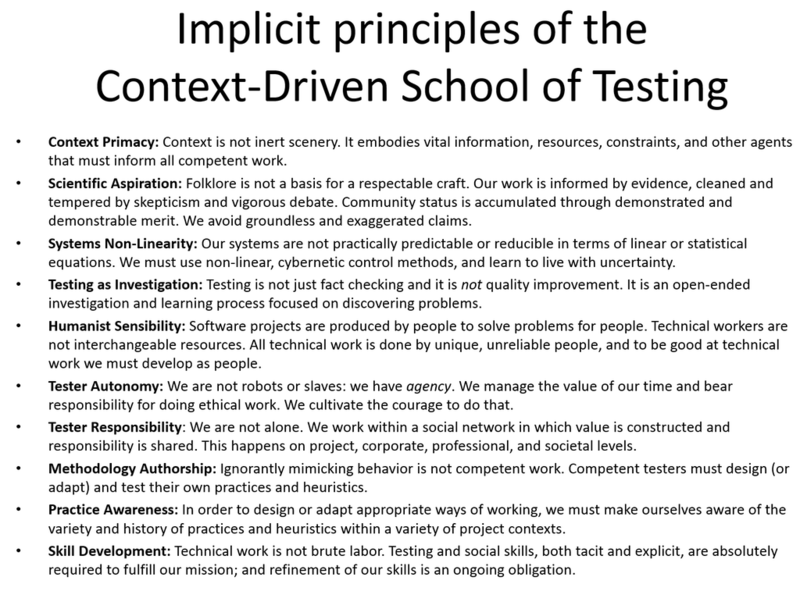 I can now speak confidently about the principles of context-driven testing and will continue to champion them. I’ve suggested two changes to James which he has agreed with. The first was the re-introduction of the concept of software solving a problem. The second is that community status was not implicit in the original principles and has been added in this new version. This exercise has prompted me to finish reading Thinking, Fast and Slow by Daniel Kahneman, analysing my own thought processes. And finally, it helped me to “keep my brain sharp” between contract roles. I remain concerned that the complex language used in these principles will hinder the widespread communication and adoption of the concepts. My concerns are valid, according to this paper by Daniel M. Oppenheimer – “Consequences of Erudite Vernacular Utilized Irrespective of Necessity: Problems with Using Long Words Needlessly”. Essentially, as the level of complexity increases the text becomes harder to understand and less likely to be accepted by the reader. Oppenheimer’s emphasis here is on ‘needlessly’ complex words. Are precision and brevity (conciseness) more important than first impressions in this case? Does the original set of principles serve the needs of newcomers adequately, lessening the need for the new version to be approachable?